126 years old company – Coca-Cola serves approximately 200 countries around the globe with Altogether 1.7 billion of Coke products eagerly consumed every day. An overwhelming number for a local company that invented the original Coca-Cola drink and typically sold it as a medicinal beverage. So how did they comfortably reach to the position in the global market they are precisely at now? Coca-Cola has managed the ability to keep their costumers interacted and involved with them through sentimental television commercials. 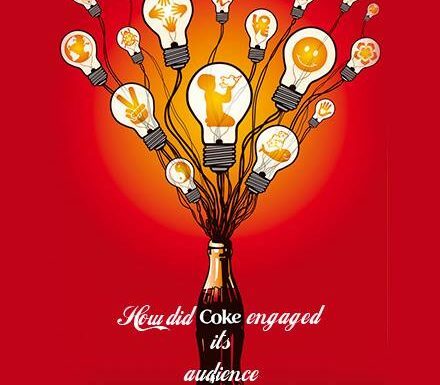 Coca-Cola’s twitter and Facebook accounts have around 2.7 million followers all about the world in which 85% of the posts aim to directly promptly engage with their loyal fans. These engagements are in the form of unique challenges, effective campaign or music events. Their most famous dare was “the bottle challenge” where contestant has to design a glass container that could be recognized in the dark. The winner produced the world’s most-famous package designs, the contour bottle. Even today, its iconic container is one of Coke’s best attributes. Coke studio, on the other hand, is the finest and the most awaited musical event that takes place globally where local musicians can properly present their modern music to their faithful followers. We are inspired by Coca-Cola’s marketing strategy and With our – TimeLine media’s fingers deep into the ‘India’s digital pie’, so to speak, as well as in other conventional means of publications, we have held our rightful place in the list of pioneering enterprises in Goa who have contributed to the growth of India’s Digital presence and continue to do so.